Join us for a fun-filled week of educational programming, as we explore inspirational tales of an inventor, a dancer, and a freedom fighter! This Black History Month program is presented in collaboration with Sweet Blackberry, an education nonprofit whose mission is to bring little known stories of African American achievement to children everywhere. The Library will offer morning and afternoon activities—centered on invention, dance, and artmaking—to complement short film screenings. 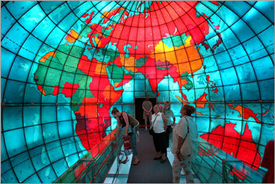 And don’t forget to explore the Mapparium all week. It’s free for everyone 17 and younger! Check out our Boston February Vacation Week guide for lots more ideas on things to do with the kids this week. The library is open during construction.